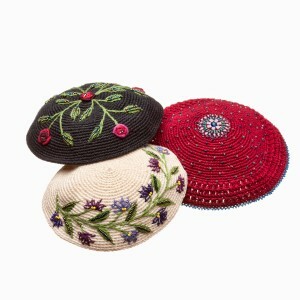 These exquisitely crocheted and hand-beaded kippot add beauty and style. They are available in eight different designs and ten colors (black, blue, brown, cream, pink, gray, navy, white and embroidered). Pre-Rosh Hashanah Sale! FREE SHIPPING and ten percent (10%) off the regular price of any Women’s Crocheted and Beaded Kippot. Available for purchase at Dunitz and Co. Fair Trade’s online store, and The Aesthetic Sense’s online store.